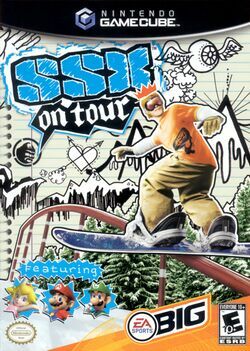 SSX on Tour is a sports game developed by Electronic Arts and the successor of SSX 3. The game is about semi-realistic snowboard and ski races on different tracks. The game was released parallel for Xbox, PlayStation 2, PlayStation Portable, and Nintendo GameCube. As an addition to the Nintendo GameCube version of the game, Mario, Luigi, and Princess Peach were added as playable characters, along with a new race track called Nintendo Village. The principal topic of SSX on Tour are races on snowboards, or alternatively on skis. While playing the game, players choose a character to race across a downhill. While doing so, the player can use the environment in form of ramps or rails to perform various tricks. The game also features a story mode which depicts a character's advancement to the top of the racer rankings, as well as a character editor. This page was last edited on June 28, 2018, at 19:28.